I am playing around with SoulCollage lately – as art therapy. Will post some creations soon. 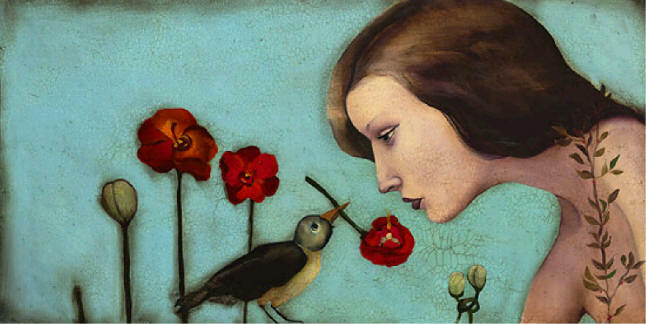 I am anxiously awaiting my giclee of The Engagement by Cassandra Barney. Lately, I am fasinated with the color blue and red poppy flowers. All her paintings are a reflection of herself in some way, all self-portraits, yet us viewers can find ourselves in them too. There’s a melancholy in these faces, a darkness, a secret, a profound sadness. When I have met Cassandra for her art shows, she seems so content, satisfied, joyful, dare I say, happy. Her paintings though reveal something else. In public, she’s the one who probably carries around the most painted face, while her paintings cautiously speak of her true inner reality. The Engagement, to me, looks like this innocent happy bird sharing a bit of that happiness with this melancholy young woman, thus “engaging” her into life. If only I had the means, I would love to cover my walls with much more of her art than I can.